LUXEMBOURG CITY — An agreement announced Nov. 15 brings together a space company looking to grow its capabilities with a government seeking to expand its presence in the space industry. San Francisco-based Spire Global announced it will establish a European headquarters in Luxembourg that will support engineering, data analytics and business development work. In turn, Luxembourg Future Fund (LFF) will invest in Spire as part of a $70 million Series C round Spire plans to close by the end of the month. In a statement, Peter Platzer, chief executive of Spire, said the funding will help the company grow its capabilities to analyze ship-tracking and weather data from its constellation of cubesats. “As Spire reaches its next stage, scaling our talented teams becomes the key challenge,” he said. The company announced it’s hired a veteran human resources executive, Campbell Fitch, to help the company find engineers and other workers to aid in its expansion. Spire has also hired a new chief financial officer, Bryan LeBlanc, who previously took public Jive, an enterprise software company acquired earlier this year. The LFF, the fund investing in Spire, was established in 2015 and capitalized at 150 million euros ($177 million) by Luxembourg bank Société Nationale de Crédit et d’Investissement and the European Investment Fund. The goal of the LFF is to support the diversification of the country’s economy. 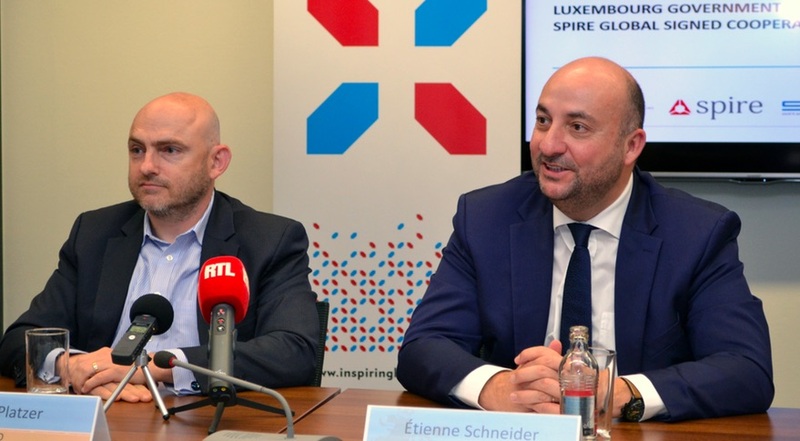 As part of the agreement, the Luxembourg government will also provide research and development grants and other funding to support Spire’s activities in the country. Neither Spire nor Luxembourg’s Ministry of the Economy disclosed the total value of the country’s contribution. In the statement from the Luxembourg Ministry of Finance, John Holloway, a member of the board of the LFF, said the fund’s investment would be made “by partnering with the initial U.S.-based VC investor who has backed Spire since its launch.” That appears to be a reference to RRE Ventures, which led Spire’s Series A round in 2014 and participated in its Series B round a year later. Space has emerged in recent years as a key focus for the Luxembourg government, seeking to tap into a vibrant entrepreneurial space industry. The government, through its SpaceResources.lu initiative, has already committed 200 million euros to support companies involved in the nascent space resources field, including Deep Space Industries and Planetary Resources. However, Etienne Schneider, deputy prime minister and minister of the economy of Luxembourg, noted the country’s activities in space date back to the formation three decades ago of SES, which today is one of the world’s largest commercial operators of communications satellites and accounts for the overwhelming majority of revenue from space-related ventures operating in the country. “By formalizing our relationship with Spire, we continue our government’s three-decade history of attracting ground-breaking companies in this sector,” he said in a statement. The announcement comes on the eve of the first NewSpace Europe conference here, an offshoot of the annual NewSpace Conference held in the U.S. by the Space Frontier Foundation. The two-day event on the commercial space industry has a European emphasis, but with some American speakers as well, including SpaceX President Gwynne Shotwell. A day before the Spire announcement, the Luxembourg Ministry of the Economy announced it had hired a former NASA official to support its SpaceResources.lu effort. Gary Martin, who recently retired from the agency after serving as director of partnerships at the Ames Research Center, will be a senior advisor in the ministry’s Office of Space Affairs.